Green ridge cucumbers are the best known variety. 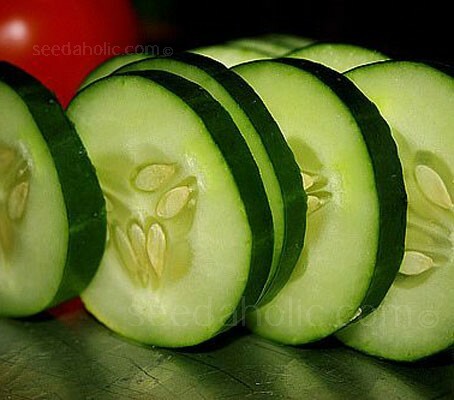 Cucumber Long Green Ridge is a compact variety and reliable cropper, that can be produced in a greenhouse or directly outdoors. Harvest 15 to 20cm (6 to 8in) in length. The name ‘ridge cucumber’ comes from the old habit of growing them on raised beds or ridges – these days they are usually grown on the flat. The plants are climbers like their greenhouse cousins – outdoors the vines are left to scramble along the ground or are supported by netting, posts, bamboo poles etc. From January to April, they can be started off in 7.5cm (3in) pots, and grown indoors, Place two or three seeds, on their sides, about 2.5cm (1in) deep per pot, which is filled with moist compost. Sometimes cucumbers transplant badly, handle with care and disturb the roots as little as possible. Cucumbers can be sown in situ from late May when all risk of frost has passed and the soil temperature is at least 16C (61F). Prepare holes 30cm (12in) wide and mix in plenty of well rotted compost or manure. Mound the planting hole up slightly as this will help with the plants' drainage. Sow two seeds per mound placing them on their sides, about 2.5cm (1in) deep. Cucumbers are warm season crops, with no tolerance to frost. They must have temperatures of between 18°C to 27°C (64-81°F). In cold areas protect the young plant with mulches or cloches. A thick mulch will also help retain water. After they have germinated thin out the seedlings to remove the weakest. Seeds germinate best if kept at 20*C (68*F). Ideal night temperature should be no lower than 16C (60F). This temperature should be maintained for four to six weeks after the seedlings have been planted out, so harden off and plant out when all frost has passed. The best forms are the all female ones. All female types may produce male flowers if they are grown under stressful conditions. These flowers should be removed. If grown in a greenhouse, keep it damped down to reduce any pests. Water regularly and feed with a high potash liquid feed every two weeks. Keep an eye out for slugs and snails especially when the plants are young. If they become a problem, use a recommended proprietary brand of slug and snail bait. Try to avoid watering from above as this may lead to a fungal problem especially in warm weather. Pick off any badly affected leaves and spray with are commended proprietary brand of fungicide.